I wanted the nursery for our fourth to be a bit different. And after hrs of looking and thinking, i found this wonderful post at Chronicle Books Blog. I dont eat or hunt deer nor am i an activist. I just loved the whimsical feel of it.And well it's different. 2. Using spray adhesive, spray one side of the nose piece and adhere it to the Wrong side of the wrapping paper. Use the craft knife and the cutting board and cut out the nose piece. Repeat for the other side of the nose. 3. Repeat to cover both sides of the two deer heads, the deer body, and the deer antler pieces. 4. Using spray adhesive, adhere the contrasting paper to one side of the mounting board. Cut it out using the craft knife and cutting board. 5. On each deer head piece, cut a hole 1″ below the top edge and 3/8″ inside the back edge with the awl. 6. 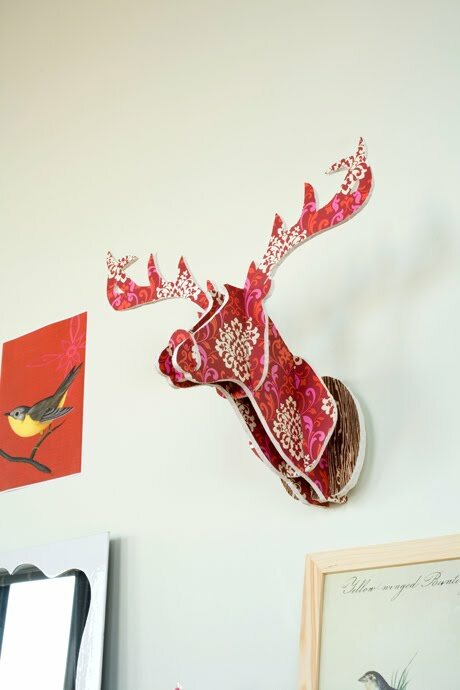 Assemble the deer head as shown in the photograph. 7. Thread wire through both holes several times and end by wrapping the wire around itself for a hanger.